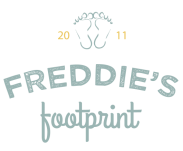 ​At Freddie's Footprint, we specialise in creating handmade personalised keepsakes of your little ones hands, feet, fingerprints and artwork to treasure for years to come. Based in Jersey, Channel Islands I work from home where you are more than welcome to come and view my work at a mutually convenient time. I hope you enjoy looking around my website and if you have any questions then please contact me here.